TCE-UK is very near to releasing the new TCE-RC mouthpiece. I have been working over the last few months to bring a custom mouthpiece to market at an accessible price. At this point you can pre-order your TCE-RC mouthpiece by contacting me using the link above. Full information about the TCE-RC mouthpiece is available on the Trumpet Planet website. Follow this link! Cup: Medium, like a Bach ‘E’ cup, approx 8mm from rim to shoulder. Backbore: Custom, dense core, centred sound. This entry was posted in Uncategorised on 07/02/2019 by Rich. 2019 looks like it’ll be another exciting year for the TCE. I’m currently in the process of creating new resources for TCE practise every day. There’s a new eBook The Seven Bugles that I’ve been planing and drafting for most of a year that has finally started to come together over Christmas. I’m already sending the exercises to my pupils and hope to have the book finished soon. For now, those of you who haven’t picked up my ebook about Einsetzen/Ansetzen; the origin of the TCE, a perfect warm-up and lip conditioner as well as 3 sets of progressive exercises to develop your embouchure; I’m now offering 25% all purchases as well as a 50% discount on your first Skype lesson when you buy the book. There is no better time to get involved in expanding your knowledge of trumpet embouchure! Check out Exploring The Double Pedal Register on my ebook store now, and use discount code “EDPR25” for 25% off your purchase. This entry was posted in Uncategorised on 20/01/2019 by Rich. This is the latest advert that Bahb and Rich have worked on together for the ITG Journal. This entry was posted in Uncategorised on 05/10/2018 by Rich. Work has begun on writing a programme and making materials for a series of online courses that anybody can take to learn the TCE. In the last year I have made a bit of online content and used Patreon as a means of communicating with pupils willing to subscribe to the service. I’ve found, however, that this is not an effective way to people to learn and so I’m moving on. Current plans have the programme split into four courses, each of which contains a series of lessons, videos, and practice materials. There will also be a forum for students to discuss the course material, share their ideas and hopefully grow a bit of a community. More news to follow once things are up and rolling! This entry was posted in Uncategorised on 04/10/2018 by Rich. Rich has been giving lessons about the Tongue Controlled Embouchure over Skype and everything is going great! After only a couple sessions pupils report development in their abilities and have a clear path of what to practise in order to meet their goals. Because learning the TCE is now a clearly structured course of learning material, coupled with logical explanations of how to get the best results from your playing, you too could notice vast improvements in your playing by taking some lessons over Skype. Not sure about the Tongue Controlled Embouchure? Get in touch and ask some questions! Sometimes just being more knowledgeable about a subject can help you to make better decisions without dramatic changes to your technique or style. This entry was posted in Uncategorised on 01/08/2017 by Rich. This entry was posted in Uncategorised on 09/05/2017 by Rich. TCE Power Training Book Out Now! A couple weeks ago Robert J. (Bahb) Civiletti and Niranjan (Nini) Wijewickrema published a new book about the Tongue Controlled Embouchure. It is packed full of historical information about playing with the tongue between the teeth as well as 170 pages of exercises and drills to build and maintain a virtuoso embouchure. Below you can read my review of that book, which is published on Bahb’s website (http://tce-studio.com). The new book can be bought on that website for only $65. “Finally a book that deeply explains (with citations) the historical narrative and modern-day relevance of the tongue controlled embouchure! All of that coupled with exercises that provide a true brass-player’s workout whilst teaching you to play correctly and develop awareness of your chops – this book is a game-changer in understanding how to become a proper virtuoso musician. There is no nonsense in this approach to playing; no time wasted on gimmicks or bravado strength building; just sensible development of the key aspects of embouchure control and real power.I have had this book for two weeks and the exercises have already added another level to my development. 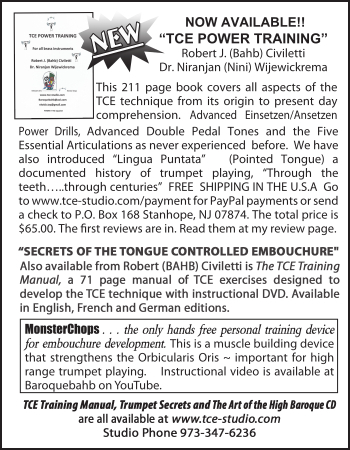 All aspects of the TCE are combined into efficient tools that train your embouchure and easily show any weaknesses. This entry was posted in Updates and tagged Bahb Civiletti, Embouchure, Niranjan Wijewickrema, TCE, Tongue Controlled Embouchure, Trumpet on 15/04/2017 by Rich. This website is new! The news page is here to announce up-coming talks, concerts or masterclasses relating to teachers of the Tongue Controlled Embouchure. Subscribe on WordPress.com to receive updates to this site. This entry was posted in Updates on 07/03/2017 by Rich.